If you’re like me, a complete video game nerd to the core, you probably had an advantage fundamentally understanding cryptocurrency when it was first widely introduced. For years, gaming studios and publishers all over the world were introducing their own in game digital currency, which could only be bought by trading in your fiat. Does that sound familiar? You could then use the currency in-game, whether it be for costumes or slight opponent advantage. Then came the loot boxes, a much more randomized system where a player will purchase in-game currency → buy a loot box with random items → pray they landed a much more expensive item for half the price. I will leave the issues with loot boxes to regulators, since many state it greatly resembles gambling. This in-game currency system for opponent advantage or social status has become the core business model for publishers, rather than the actual game itself. Let’s use the crazy popular last man standing game “Fortnite” as an example. They use a free to play model. In this model, the game itself is completely free to download and enter. However, if you want the premium content and offers, get ready to shell out $5 minimum. For even better content, expect to be spending monthly. This goes against the old models for revenue, where you payed $60 for the complete game and that was it. At face value, it may seem like the publisher is sacrificing revenue to generate player activity, but that is not the case. “Fortnite now has 45 million players and over 3 million concurrent users”  Lets break this down. That’s $20,500,000.00 in yearly revenue from ONLY HALF their free to play user base of concurrent players. The other half of purely free users can bring in revenue from word of mouth and streaming on platforms such as Twitch. We can probably assume this is a low ball estimate in revenue. Please note that these are speculative numbers and the dollars spent per player is not open data; but the numbers I’ve chosen are reasonable for a typical gamer. This is much more profitable then the $60 per game model. Free players may think they are playing at a discount, but many are spending far more at the end of the year! If you spend $10 a month (which players tend to do) on in game (rather than $60) than you can expect to pay double for the same game. So, how does this relate to cryptocurrency and blockchain technology? There are many cryptocurrency organizations and business that want to evolve into game money and further into full cryptocurrency with trading capabilities that are reflective of popular videogames. I think it is important for us to consider an analysis to determine if this is a needed technology for videogames, or if its obstructive to the already thriving entertainment. Here I will present an analysis whether cryptocurrency has value when it is deployed for a videogame? How would it effect the game product. Crypto and blockchain capabilities won’t inherently affect the actual gameplay of a videogame. Blockchain capabilities spread as far as distributed management and recognition, neither of which are needed for the immediate entertainment experience. Art, CGI, developers and talented individuals in design ETC are the primary providers of the experience, as it should be. The possibilities for the alteration of gameplay is if the token price reflects better items in-game that change the dynamic of the entertainment. Let’s use a Player 1 Vs. Player 2 duel as an example. If token A is worth more on the market than token B, then the items from token A might be completely superior. Therefore, player 1 will win automatically. This could be a huge problem. Because if player 1 wins based on equity in the market, and not gaming skill, the entire game is corrupted. Game players will not tolerate this reality. If the game is corrupted it will lose value immediately with the general player base. It will be a game driven by traders only. 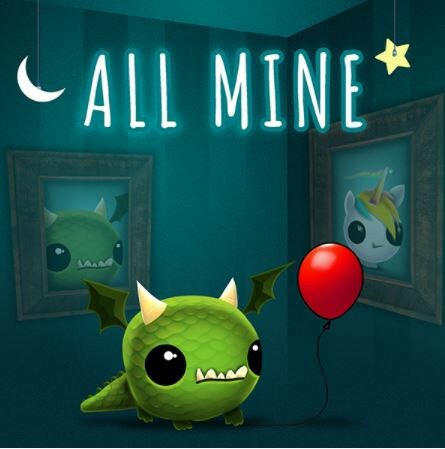 I personally have not developed an opinion on the “All Mine” game and concept. Until this game is widely played or gains awareness from the community, we won’t know what affect it may have on gaming or on blockchain. I will state that this game is not story related and these are typically design driven puzzle games. This should be ok for mining potential. The issue I present for questionable narrative in videogames comes from a moment where we may go to far. What happens when mining through gaming is so popular, that triple A titles like Halo, for example, start having mining sequences in between storytelling. Something along those lines can completely destroy the art and talent that created it and pull the gamer completely out of the narrative. Would you stop in between a Martin Scorsese movie to mine crypto? Why does this happen? In short the answer is fixed trading. Every videogame garners a community of people chatting about it. In almost every case of a major competitive videogame (with items or rank-ups) you will find players cheating the system. With trading, they do this by placing online team bets, where players can wager their items in competition. It becomes insider trading when the losing team only loses because of a private deal before the match. A rigged match means rigged profits. This black market is only intensified by crypto, because in this game you aren’t only playing for items, but for crypto that can be traded for real cash. This could cause real world volatility! That’s a serious problem for video cryptocurrency. Until a solution is met, this is the biggest issue for gaming companies investing into crypto tech. Verdict: Gaming at this point does not need cryptocurrency as a means for in-game purchase. There are many boxes to check off before taking that route, specifically insider trading within videogames. Possible Solution: In-game currency should be tokenized only for the purpose of insuring purchase validation on a blockchain. It can also be used to insure account verification and trust on large game markets. EX:Steam accounts purchasing or downloading.